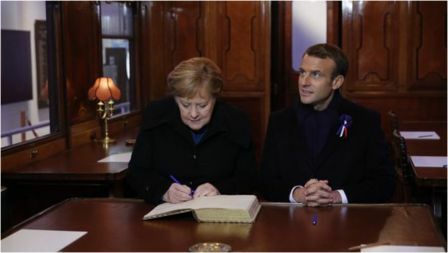 French President Emmanuel Macron and German Chancellor Angela Merkel have left their own mark of reconciliation at the start of events to mark the centenary of the end of World War One. They signed a book of remembrance in a railway carriage identical to the one in which the 1918 Armistice was sealed. The moment was doubly significant because Adolf Hitler used the same carriage to accept France's capitulation to Nazi Germany in June 1940.